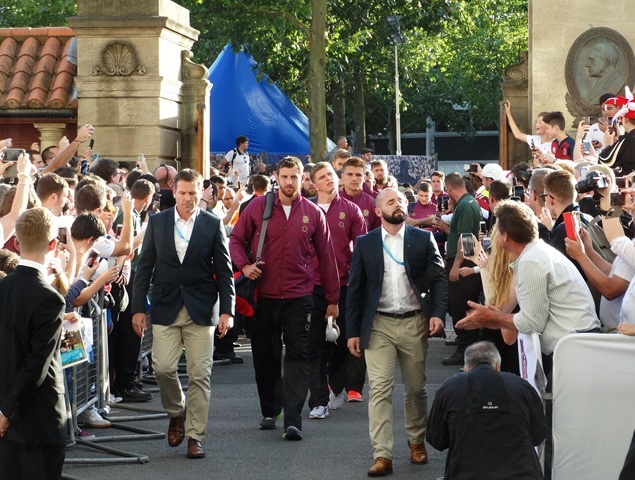 England’s first Rugby World Cup warm-up game at Twickenham saw plenty of changes both in the playing squad and in and around the stadium. First my opinion of what happened in the game. Clearly this was a game where England’s coaching team were going to try out some of the fringe players with a view to whittling down the squad from 38 to 31 players by the end of the month. The forwards struggled at times in the set piece but the game started with was a second or third choice front row. 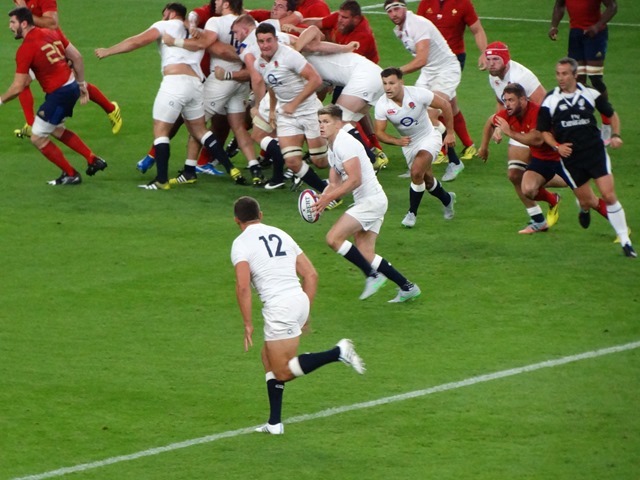 Neither Brookes, M Vunipola nor Webber would normally start for England and the scrum looked much steadier once Wilson and Corbisiero came on. I would expect that Brookes would be the prop to be dropped from the squad given that Corbisiero can play both sides of the scrum, leaving Marler and Cole as the starting loose-head and tight-head. George Kruis had a good game and assuming that Lawes and Launchbury will be the starting locks, it may mean that either Parling or Atwood may not make the final 31. Ben Morgan looked desperately short of match practice so I think he will share No 8 duties with B Vunipola in the final two warm-up games. The biggest question of the day was how will Burgess and Slade perform. I hadn’t really watched Burgess play before but he had a very good game both in attack and defence and I expect him to be picked as an inside centre along with Barritt. Luther Burrell must play in the next game in Paris to see what he can offer as I think his place may be under pressure if Lancaster decides that Slade’s flair and versatility makes him the ideal understudy for Joseph. Unfortunately I can’t see Twelvetrees making it. I was particularly impressed with Alex Goode who has struggled to come out of the shadow of Mike Brown over the past couple of seasons, but his ability to be an extra playmaker must see him retained meaning that Danny Cipriani won’t make the cut. Let’s see if any of these predictions prove correct. Off the field Twickenham was quite different to the usual Six Nations or Autumn International experience. The West car park has always been free for anyone to enter but as this was a rehearsal for the World Cup games to come, we were under World Rugby protocols. The West Village was now part of the stadium concourse as the entry gates had been moved out to Whitton Road with no re-entry allowed, so once you were in, you stayed in. Not that there wasn’t plenty to see and do with entertainment laid on and plenty of bars and food outlets. The A316 had been closed but I haven’t yet heard about what traffic problems this may have caused. I wasn’t the only one who wondered if this was really necessary bearing in mind that Twickenham hosts sell-out game several times every year without the need for road closures, but this is what the Tournament organisers wanted. Hospitality in the Spirit of Rugby in the West Stand had also been given a revamp. Gone was the sit down three course lunch to be replaced by a hot and cold buffet with ‘grazing stations’ and ‘circulating bowls’. All I can say is that everyone agreed that it worked very well with the more informal surroundings a welcome change to the usually quite stuffy atmosphere there has been in the past. Hopefully the RFU will look at this once the World Cup is over although they will be aware that there were far fewer guests than usual. Despite the crowd being only 63,000 strong, their support was passionate and they made almost as much noise as a full house and they would have left happy with a win, albeit with some wobbles towards the end. Getting home from Twickenham after a late kick-off is a challenge but various strategies had been put in place, including a Park & Ride at Kempton Park, buses to Richmond and Waterloo and bars at the ground remaining open until 11pm so journeys could be staggered. The news about the bars opening late was greeted with a loud cheer from the crowd when the announcement was made during the game! As this was just a warm-up game there wasn’t a formal sit down dinner for the players although they came into the Spirit of Rugby to be fed from a buffet dressed in polos and training bottoms. 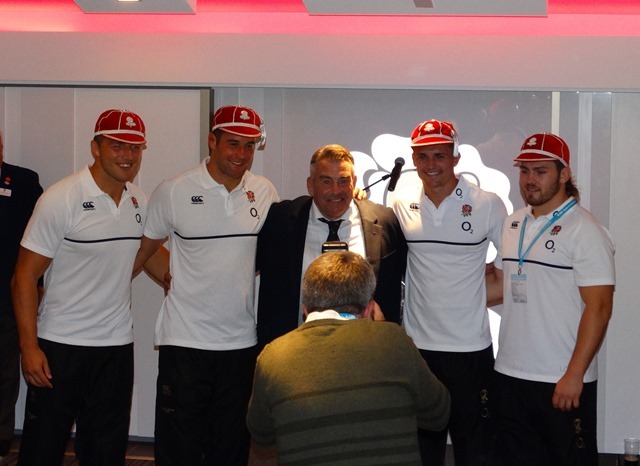 Afterwards most of them mingled with the guests until one important formality was performed when RFU President Jason Leonard presented the four England debutants with their England caps. So a successful day for England and for England Rugby 2015 who are organising the tournament. The off-field changes worked well in general although there is an opportunity to do some tweaking when Ireland come to Twickenham on 5 September. Stuart Lancaster however has more difficult decisions to make and he has one more chance to see how players perform next week before making his final decision.